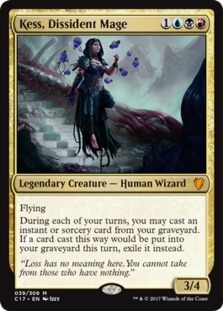 Kess’s ability is fantastic, and its clear why she is now considered a tier 1 EDH general. Each turn, you can cast an instant or sorcery card from your graveyard, so she essentially gives every card of these subtypes flashback without the extra cost typically associated with that keyword. Just like with flashback, the card cast from your graveyard is exiled, but you get two casts of every spell in your arsenal at this rate, and that’s amazing. I knew that I would want to build a “spellslinger” style deck with her, which essentially relies on cheap removal and then either using a combo to win or burning your opponents down with X cost spells. I have several win-cons baked in, but let’s start by looking at the creatures I’ve selected, as there aren’t many of them. Most of the creatures were picked due to their interactions with spells. For instance, Baral makes my instants/sorceries cost 1 less mana. Charmbreaker Devils recur my instants/sorceries. Guttersnipe pings my opponents each cast, while Young Pyromancer, Docent of Perfection and Talrand all create tokens per cast. Melek changes up the playstyle a bit but feels on theme, because you get to cheat spells casts from the top of your library instead of from hand (functionally card draw) and if you cast from your library you get to copy the spell. Early game you’re going to want to try and control the board until you can find combo pieces or win cons. The Storm keyword allows you to copy the spell as many times as you cast spells before it. So let’s say you manage to cast 5 spells, and then cast one of these storm cards, you’ll get to copy that last effect 5 times. Kess’s ability means you can add on spells even if you don’t have them in hand, and tools like Twincast will allow you to make copies, not to mention Melek being able to as well. If played right storm abilities can be powerful. Lastly, cards like Aetherflux Reservoir interact well with trying to storm, because you gain exponential life with each cast trigger. You can use this artifact to eliminate enemies from the board, though you’ll have to be careful when you pull the trigger. You won’t have to be as careful if you can successfully cast some of these beauties. Taking extra turns is mostly a blue thing, so the majority here are, and each has it’s own little caveats. Time warp is the most straight forward — you just take an extra turn. Beacon of Tomorrows can benefit you later if a game goes long enough, because it gets shuffled back into your library. Temporal Mastery is a great top deck due to it’s miracle cost being much cheaper (this can also benefit a storm run). Lastly the black option here can be stopped, but an opponent will have to pay half his/her life to do so, which most people aren’t going to want to do unless they are already at a low life total so clearly you’d want to play this one earlier in the game. One way we can affect our storm abilities, or burn down enemies with X cost spells is by generating infinite mana. One way to do so is with the combination of Isochron Scepter and Dramatic Reversal along with a 3-mana producing mana rock like Basalt Monolith or Thran Dynamo. Bonus, you can tutor up Dramatic Reversal with Mystical Tutor. The rest of these cards fall under utility mainly because they help the rest of your board state or can be win cons in themselves. I’ve included a few tutors to get out combo pieces or answers, Jace’s Sanctum works like Baral in making my spells cheaper and Primal Amulet does as well, then once it is flipped it will copy spells. Swarm Intelligence also copies spell casts, while Secrets of the Dead provides card draw for all those spells that you’ll be casting from your graveyard. Metallurgic Summonings can quickly make an army of constructs if left unchecked, and Insurrection can steal you an army of creatures if your opponents have a bigger-than-you board state. Lastly, Sunbird’s Invocation also gets you more spell casts, and many of these effects can culminate in some crazy turns. I look forward to finishing off this build and testing it out! You can see the full deck list here.